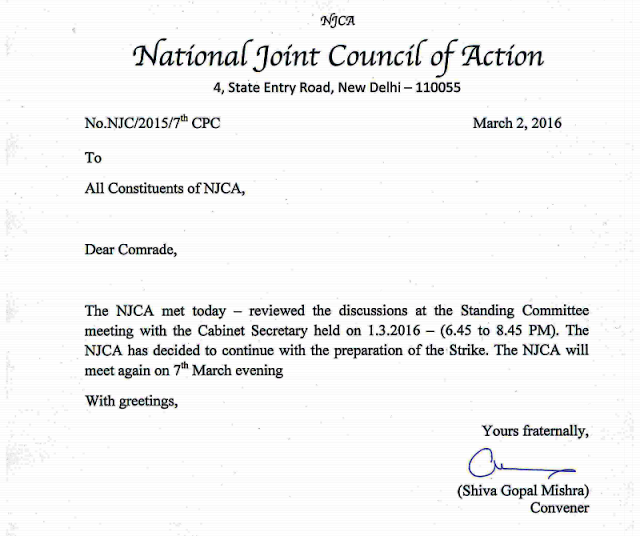 NJCA CIRCULAR TO CONTINUE WITH STRIKE PREPARATIONS. The instructions issued by Department of Personnel & Training provide for reservation in promotion to persons belonging to Scheduled Castes (SCs) and Scheduled Tribes (STs) in posts in the Central Government upto the lowest rung of Group 'A'. These instructions are also being implemented by Central Public Sector Undertakings, wherever reservation in promotion is applicable. The Supreme Court in its judgment dated 19.10.2006 in the matter of M. Nagaraj & Others vs. Union of India and Ors., while upholding the validity of some of the Constitutional Amendments, observed that the concerned State will have to show in each case the existence of compelling reasons, namely, backwardness, inadequacy of representation and overall efficiency of administration before providing reservation in promotion. In order to provide impediment free reservation in promotion to SCs and STs, the Constitution (One Hundred and Seventeenth Amendment) Bill, 2012 was introduced in Rajya Sabha in September, 2012. The Bill was passed by the Rajya Sabha on 17.12.2012 and transmitted to the Lok Sabha for consideration and passing. The Bill could not be considered in the Lok Sabha and lapsed on the dissolution of 15th Lok Sabha. The issues emanating from the Supreme Court judgment in M. Nagaraj case are under examination. This was stated by Minister of State for Personnel, Public Grievances and Pensions and Minister of State in the PMO Dr. Jitendra Singh in a written reply to a question by Shri Kaushal Kishore in the Lok Sabha today. As per the Right to Information Act, 2005 it is mandatory on the part of Public Information Officer either to provide the information or reject the request for any of the reasons specified by the RTI Act within 30 days of receipt of the request. However, information concerning life or liberty of a person has to be provided in forty-eight hours of the receipt of request. Similarly, as per the RTI Act, an appeal shall be disposed of within 30 days on the receipt of the appeal by the First Appellate Authority or within such extended period not exceeding a total of 45 days from the date of filing thereof, as the case may be, for reasons to be recorded in writing. The Act, however, does not prescribe time limit or target for disposal of 2nd appeal/complaint by the Central Information Commission. The Commission, however, on 22.03.2011 decided that each Information Commissioner including Chief Information Commissioner will endeavour to decide about 3200 appeals/complaints per year. During 2015, a total of 27,922 appeals/complaints were disposed off. This was stated by Minister of State for Personnel, Public Grievances and Pensions and Minister of State in the PMO Dr. Jitendra Singh in a written reply to a question by Shri Sharad Tripathi, Shri Y.V. Subba Reddy and Shri K.N. Ramachandran in the Lok Sabha today.